Learning is an active process and individuals learn best from instruction that is hands-on and related to life experiences. All students should have the opportunity to learn. However, the capacity for success is diminished if students are absent or distracted by unhealthy behaviors or hazardous situations. Health Education must be a collaborative process between family, school and community. Health-literate students should have the capacity to obtain, interpret, and use basic health information and skills to enhance individual health. Health instruction focuses on the health and wellness of students and must become an integral and consistent part of the total school program. Instruction that begins while children are young and continues through youth reinforces the positive behaviors to be sustained throughout adulthood. On a day-to-day basis, schools are among the safest places for our nation's children. To ensure that our schools remain safe, it is important that school districts develop and implement sound policies and procedures. Healthy School Environment includes the physical surroundings and the psychological climate and culture of the school. Factors that influence the physical environment include the school building and the area surrounding it, any biological or chemical agents that are drimental to health, and physcial conditions such as temperature, noise and lighting. The psychological environment includes the physcial, emotional, and social conditions that affect the well-being of students and staff. Nutrition services support the Coordinated School Health Program by introducing healthy eating patterns and concepts to students, reinforcing nutrition concepts introduced in the health education curriculum, and contributing to students' overall health and readiness to learn in the school community. Nutrition services assure access to a variety of nutritious, affordable and appealing meals in school that accommodate the health and nutrition needs of all students. School nutrition programs reflect the U.S. Dietary Guidelines for Americans and other criteria to meet the complete nutrition needs of students. 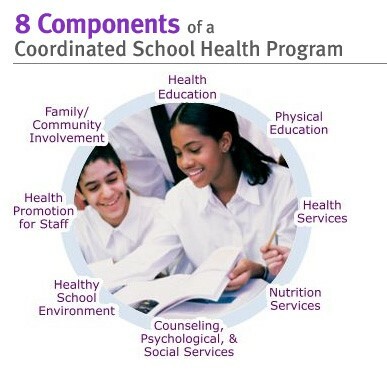 The Health Services component of a Coordinated School Health Program incldues services provided for students to appraise, protect and promote health. These services are designed to ensure access or referral to primary health care services, or both, foster appropriate use of primary health care services, prevent and control communicable disease and other health problems, provide first-aid care for illness or injury, promote and provide optimum sanitary conditions for a safe school facility and school environmnet, and provide educational and counseling opportunities for promoting and maintaining individual, family, and community health. The Office of Coordinated School Health supports the belief that a quality physical education program is a crucial component of a student's overall education. Every student in Tennessee will benefit from an educational process that utilizes the skills, attitudes and information needed to develop and maintian a healthy and physically activie lifestyle. In addition to a student's physical well being, his or her mental health can be effectively addressed through a coordinated approach to school health. Today many students have the added stress of coping with emotional challenges stemming from problems such as parental divorce, alcoholism, abuse, and drug addiction. Services include individual and group assessments, interventions, and referrals. A healthy school is vital to a healthy community. Creating and sustaining a healthy and safe school enviornment requires the continued commitment and involvement of the school and community to address the ever-changing needs and circumstances affecting our students' health and safety. Students are not the only ones who need good health. An employee's mental health and physical health are essentail to the success of a school system. School personnel who want to encourage children and teens to live a healthy lifestyle will be more successful if they model healthy behaviors.